Soldiers have pulled a man alive from the rubble of a large mosque that collapsed in northern Lombok during Sunday night's powerful earthquake. Video shot by a soldier on Monday shows the rescuers shouting "Thank God" as the man is pulled out from a space under the Jabal Nur mosque's flattened roof and staggers away from the ruins supported by soldiers. "You're safe, mister," says one of the soldiers as emotion overcomes the saved man and villagers crowd around him. 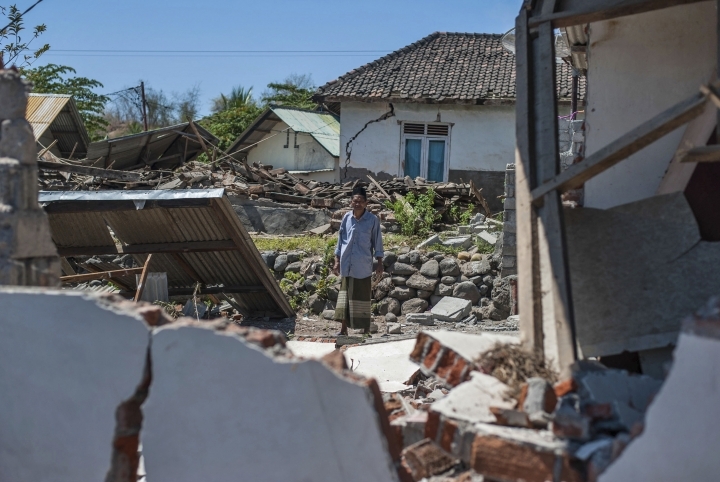 The north of Lombok has been devastated by the magnitude 7.0 quake and rescuers are struggling to reach all the affected areas. Efforts to find survivors in the ruins of Lading-Lading village's mosque that collapsed while worshippers were praying are continuing Tuesday. A backhoe was dragging away parts of the collapsed structure. 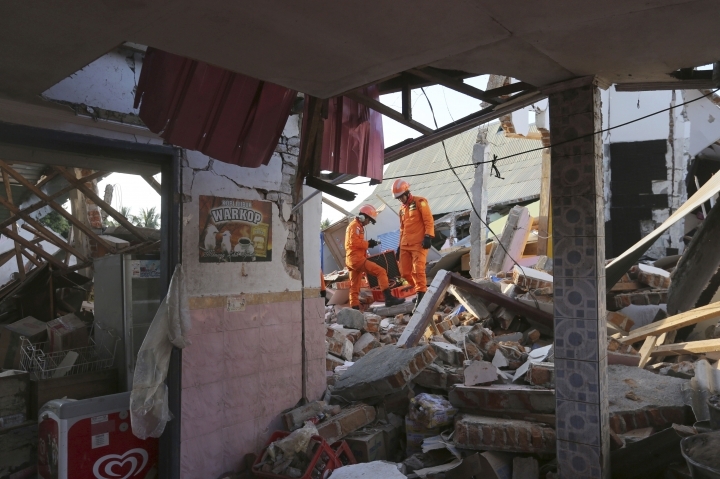 The toll of at least 98 dead is expected to rise as rescuers reach more devastated areas. Pope Francis has expressed great sadness over the loss of life and destruction of property caused by Indonesia's quakes. In a telegram Monday, Francis also offered his "heartfelt solidarity" for those affected. The message said he was praying for the souls of the dead and for "the consolation of all who grieve the loss of their loved ones." Francis also invoked "divine blessings of consolation and strength" upon Indonesia's people. Francis offered encouragement to rescuers and others assisting victims. 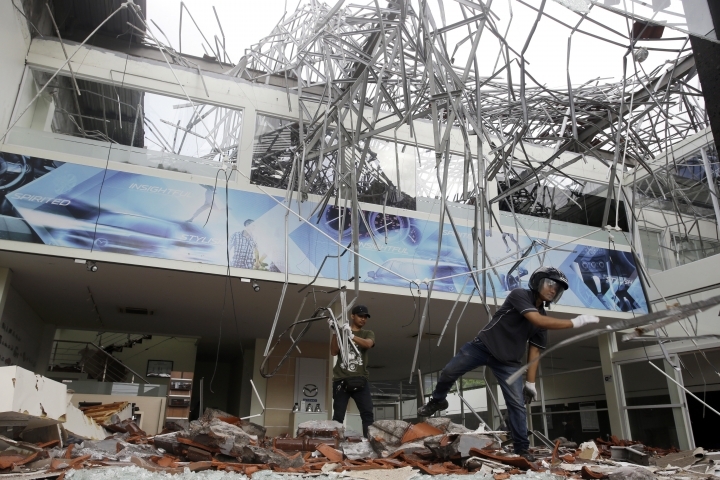 An earthquake Sunday killed at least 98 people, including some who perished inside buildings that had been weakened by an earlier July 29 quake on the tourist island of Lombok. Rescuers haven't reached all of the devastated areas and there are fears the death toll could climb. 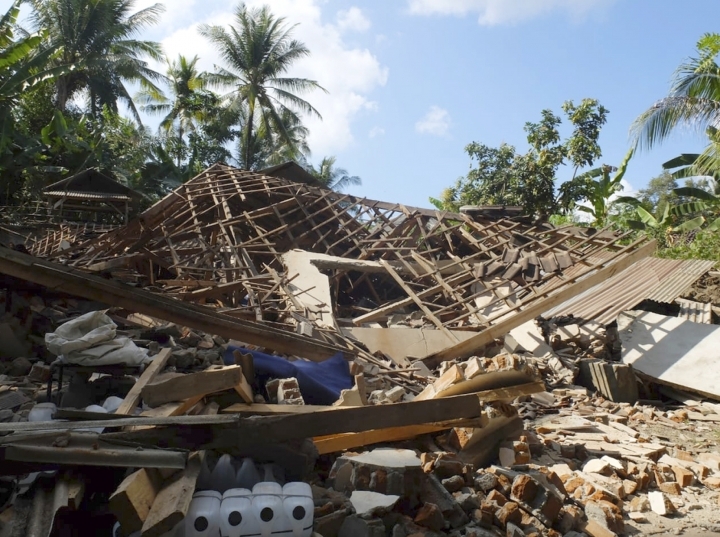 National Disaster Mitigation Agency spokesman Sutopo Purwo Nugroho says the death toll from the Lombok earthquake has risen to 98 from the previously announced 91. 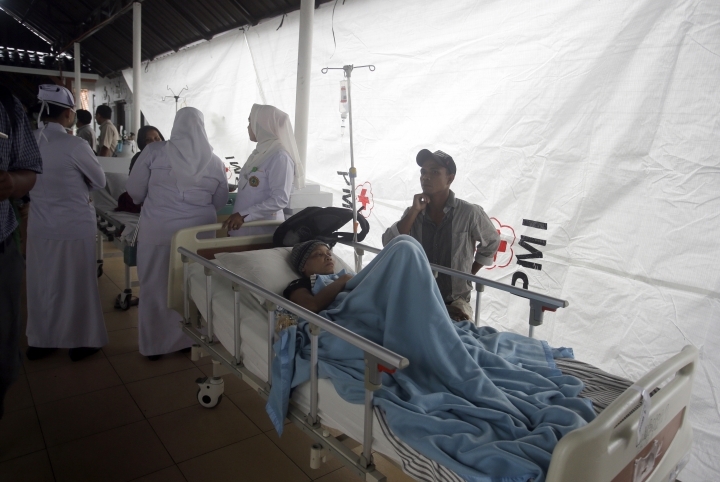 Officials have been saying the number of deaths would increase as rescuers reach cut-off areas in north Lombok. Photos and video from the disaster agency showed Sunday's night quake had reduced the mosque to a mound of rubble. 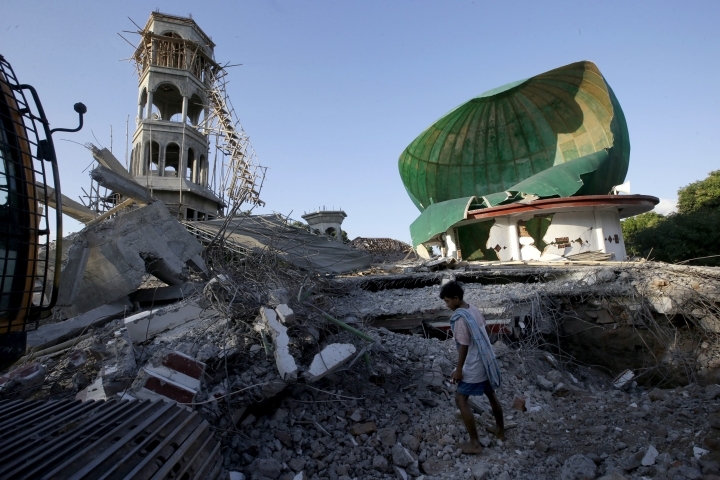 An Indonesian disaster agency official says efforts to find victims in the rubble of a mosque collapsed by Sunday's earthquake in north Lombok has been hampered by the lack of heavy equipment. 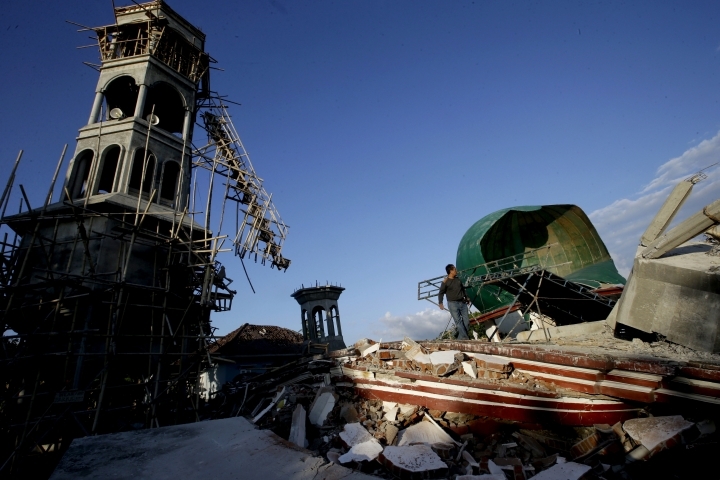 National Disaster Mitigation Agency spokesman Sutopo Purwo Nugroho said at a news conference Monday afternoon the current toll of 91 dead will "definitely increase," citing the mosque as an example of the devastation still being accounted for. He said reports that seven Indonesian tourists were killed on Gili Trawangan island near Lombok have not been verified yet. Authorities are trying to evacuate several thousand locals and tourists from Trawangan and two other popular vacation islands. An Australian man who manages a resort on the Indonesian island of Lombok says he and his family made a 3-kilometer (2-mile) dash up a mountain to escape a potential tsunami after a strong earthquake shook the island. Evan Burns, who manages a resort on Lombok, says his house is now uninhabitable, having sustained severe structural damage from the magnitude 7.0 quake that hit the island Sunday evening, killing at least 91 people. Authorities issued a tsunami warning after the quake hit, but lifted it a short while later. Burns said Monday that that the force of the quake "was so severe, it threw us out of bed, and the walls immediately started cracking." 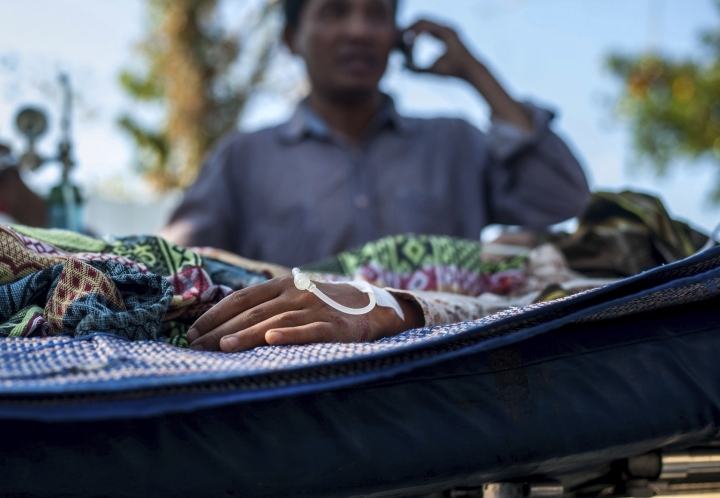 After dashing up the mountain, Burns, his wife and their 2-year-old son waited in the dark with about 200 other people from their village for the danger to pass. He has since returned home. Australian Foreign Minister Julie Bishop said Australian officials were making their way to Lombok to help Aussies caught up in the disaster. 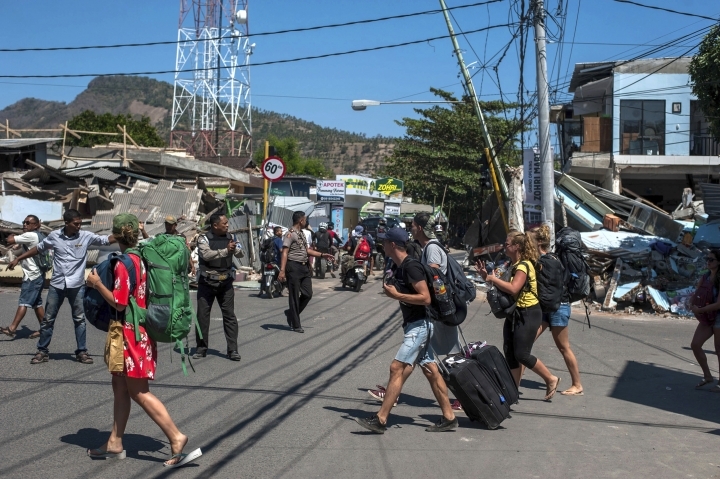 A British tourist on Gili Trawangan island near Lombok says thousands of people, locals and tourists, are trying to get off Trawangan, one of three popular Indonesian vacation islands off the northwest of Lombok, after spending a night outdoors. Saffron Amis from Brighton says thousands of people fled to a hill near the hostel where she was staying after Sunday evening's quake, fearing a tsunami. She says "there was a lot of screaming and crying particularly from the locals. 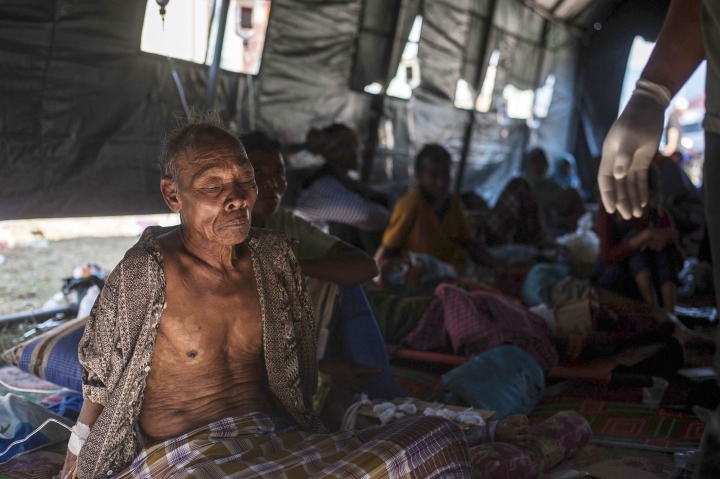 We spoke to a lot of them and they were panicking about their family in Lombok." There's widespread building damage and a somber mood on the island a day after the quake, Amis said, adding she feels lucky to be unharmed. Authorities say the death toll now at 91 is likely to rise. 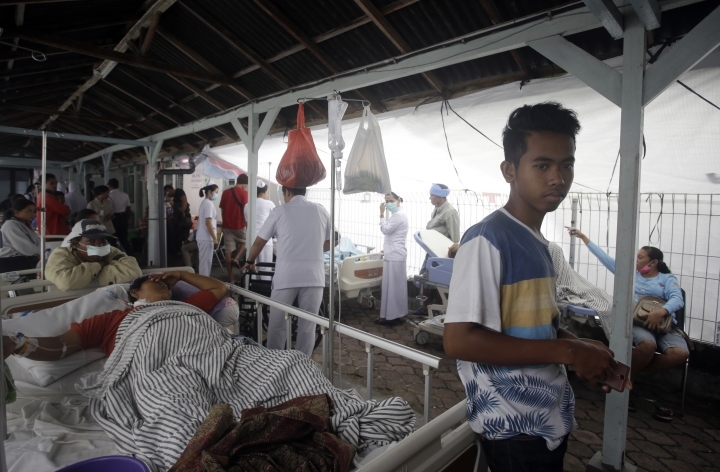 Indonesia's National Disaster Mitigation Agency says the death toll from the earthquake on Lombok has risen to 91 and could rise further as rescuers still haven't reached some of the worst affected areas in the north of the island. 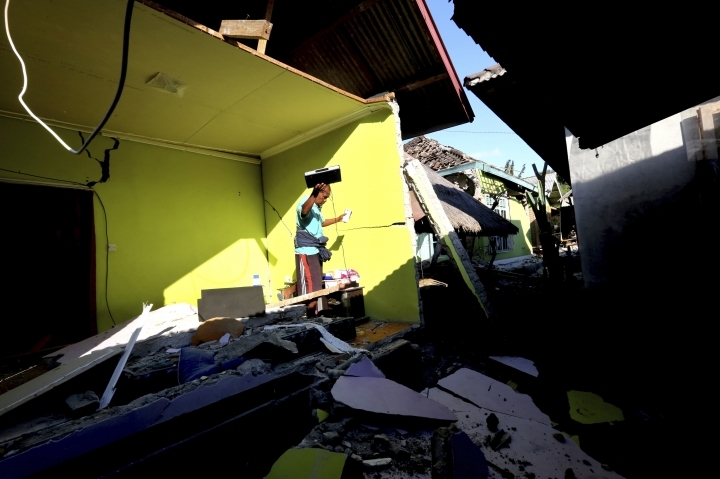 Spokesman Sutopo Purwo Nugroho said there is "massive" damage in north Lombok from the quake that struck early Sunday evening. He said thousands of houses and other buildings have been damaged and most of the deaths counted so far were caused by collapsing houses. President Joko "Jokowi" Widodo has ordered cabinet ministers and military and police chiefs to accelerate the disaster relief effort. Authorities say foreign and Indonesian tourists are being evacuated from popular vacation islands off the northwest of Lombok following Sunday's powerful earthquake that killed at least 82 people. National Disaster Mitigation Agency spokesman Sutopo Purwo Nugroho said there were no fatalities among tourists on the three islands Gili Trawangan, Gili Meno and Gili Air. He said three ships had evacuated 1,000 tourists so far. Four agencies including the military and the national search and rescue agency are involved in the evacuation. Thousands of homes were damaged by a powerful earthquake Sunday on the Indonesian tourist island of Lombok. 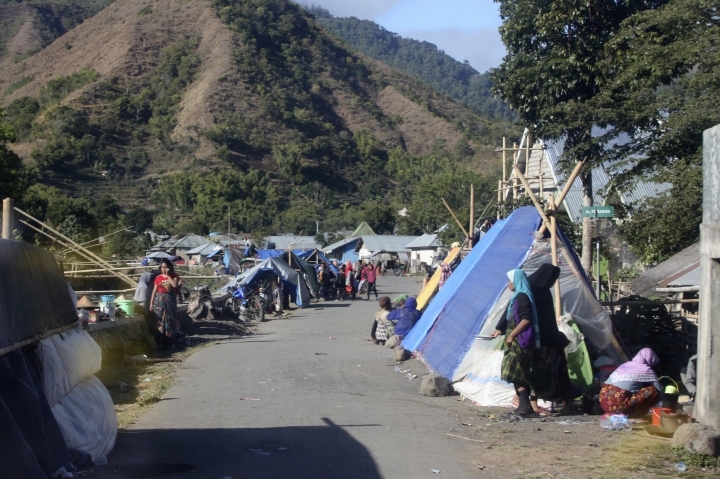 National Disaster Mitigation Agency spokesman Sutopo Purwo Nugroho said the death toll had risen to 82 with hundreds injured. Most of the deaths were caused by collapsing houses. 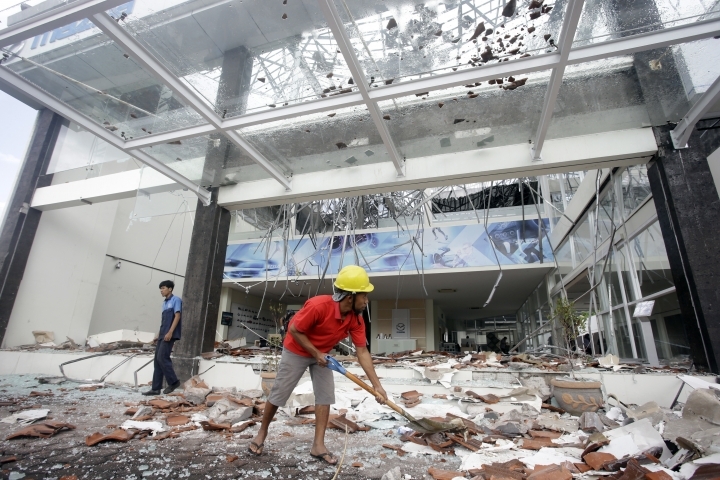 The magnitude 7.0 earthquake early Sunday evening struck in the northern part of Lombok and was also felt on Bali, where the airport terminal had ceiling tiles shaken loose. Australia's home affairs minister has tweeted that he and his delegation have been safely evacuated in darkness from a Lombok hotel where they have been staying during a regional security conference. Home Affairs Minister Peter Dutton told Fairfax Media that he was on the hotel's 12th floor when the quake struck. He says the quake "was powerful enough to put us on the floor" and cut power. Australian Prime Minister Malcolm Turnbull told Nine Network television he will call Indonesian President Joko "Jokowi" Widodo on Monday "to offer all the Australian assistance that can be made available." He says there are no reports of injured Australians. Model Chrissy Teigen has shared her shock and worry in real-time during a powerful and deadly earthquake in Indonesia with her social media followers. The model, along with singer-husband John Legend and their two children, felt the shaking while on vacation in neighboring Bali on Sunday. The magnitude 7.0 quake has killed at least 39 people on the tourist island of Lombok, about 50 miles (80.5 kilometers) from Bali. A brief tsunami warning went into effect but was later lifted. 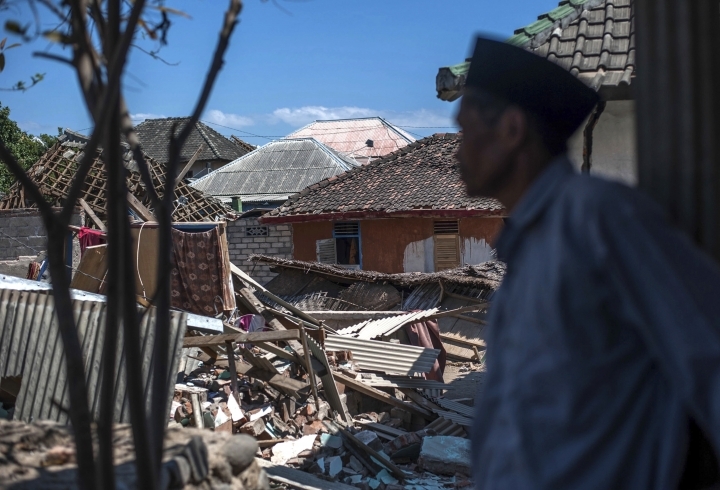 The head of the disaster management agency in Indonesia's West Nusa Tenggara province, Muhammad Rum, says the death toll from an earthquake that hit the tourist island of Lombok has risen to 39. An Indonesian official says at least three people have been killed after a strong earthquake struck the popular tourist island of Lombok. Authorities have lifted a tsunami warning that was issued after the quake struck early Sunday evening. The U.S. Geological Survey says the quake had a magnitude of 7.0 and a depth of 10.5 kilometers (6 miles). A magnitude 6.4 quake hit Lombok, which is just east of Bali, on July 29, killing 16 people. 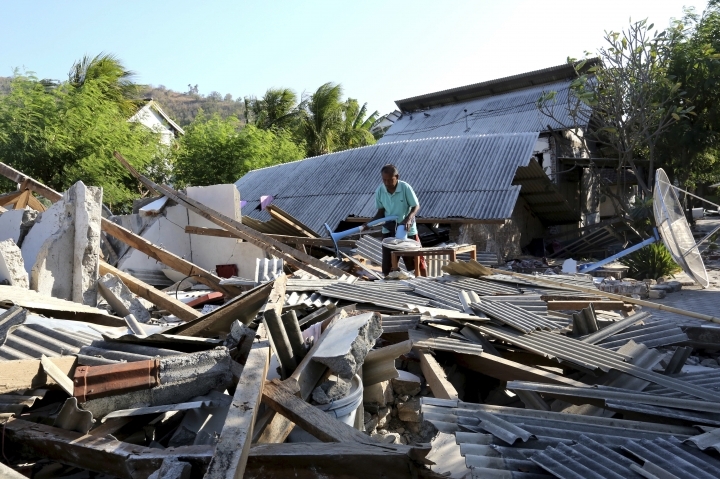 Indonesian authorities have lifted a tsunami warning that was issued after a strong earthquake struck the popular tourist island of Lombok. Dwikorita Karnawati, head of Indonesia's Meteorology, Climatology and Geophysics Agency, told MetroTV that the tsunami warning has ended. She said the warning was for the lowest level of tsunami, and that small waves just 15 centimeters (6 inches) high were detected in three villages. The U.S. Geological Survey says the quake Sunday evening had a magnitude of 7.0 and its epicenter was about 2 kilometers (1 mile) east-southeast of Loloan, with a depth of 10.5 kilometers (6 miles). A strong earthquake has struck Indonesia's popular tourist island of Lombok, one week after another quake in the same area killed more than a dozen people. The National Disaster Mitigation Agency says the latest quake, which struck early Sunday evening, has the potential to trigger a tsunami. The U.S. Geological Survey says the quake had a magnitude of 7.0 and its epicenter was about 2 kilometers (1 mile) east-southeast of Loloan, with a depth of 10.5 kilometers (6 miles).